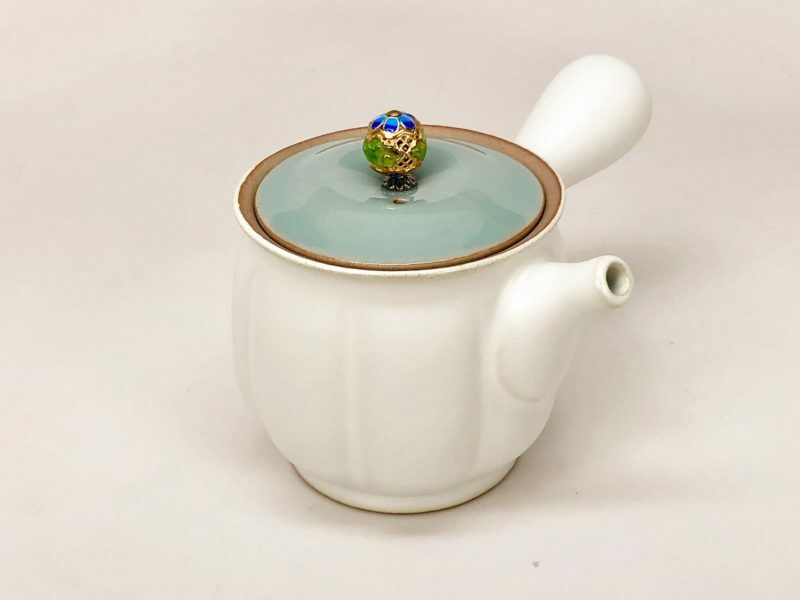 This Ding Kiln side handle tea pot is popular for brewing sencha, kukicha, and herbal teas. The matte white of the body contrasts with the blue lid, and the side handle design makes it easy to pour. This ceremony grade Ding Kiln side handle tea pot is made in the style of the famous Ding Kiln. Its glaze is a very smooth, fine matte white. The muted turquoise of the lid contrasts beautifully with the pale color of the pot’s body. The delicate, detailed bead of the lid’s handle adds a bright, eye-catching accent. Because of this pot’s distinctive placement of the handle on the side, the pour is easy to control while putting minimal strain on the wrist. The inset strainer behind the short spout holds tea leaves inside while pouring. This pot makes an excellent set accompanied by the matching Ru Yao Moonlight Glaze Ceramic Cup. This style of pot was frequently used during the Song Dynasty. However, today, these side-handled pots are much more popular in Japan for brewing loose-leaf sencha and kukicha teas. The Chinese do not use them often anymore, with the exception of using them to brew herbal tisanes. This cultural tendency to use this old-fashioned style of pot for herbal remedies supports the theory that tea was originally used as another herbal before tea culture grew up around it.